English and Turkish cafe on St George's Walk. It opened in January 2019. By July 2012 it was a cafe and sandwich shop called Caffe Nosh photo. Inside, this still had many of the original features from when it originally opened in 1973 as Sergio's Continental Bar; see photos. We think there may have been a change of management some time between July 2012 and October 2013. Certainly the choices on the menu changed, and also the menu started spelling the name as "Café Nosh" rather than "Caffe Nosh". In any case, this version of it closed in mid-2014. It was vacant as of August 2014, and still vacant as of July 2015, September 2015, May 2016, March 2017, October 2017, June 2018, and August 2018. As of December 2015 there was a notice outside dated 15 November photo stating that an application had been made for live music, recorded music, supply of alcohol, and late night refreshment on the premises. However nothing seemed to come of this. 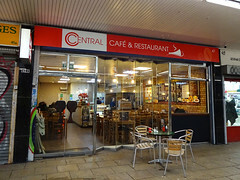 As of October 2018 there was shopfitting work going on inside, culminating in an English and Turkish cafe called Central Café & Restaurant opening in January 2019. Existence last checked in April 2019. Last edited 2019-04-11 18:24:15 (version 34; diff). List all versions. Page last edited 2019-04-11 18:24:15 (version 34).